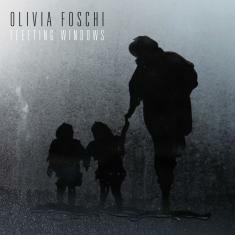 Italian-American vocalist Olivia Foschi will release her sophomore album entitled Fleeting Windows on August 24, 2018; the official record release concert is scheduled for 8:15 p.m. that evening at ShapeShifter Lab in Brooklyn, NY. The record was produced by Ulysses Owens, Jr. who plays drums/percussion on all tracks, and features Gil Goldstein, accordion/piano/Rhodes; Billy Test, piano/Rhodes; Alex Sipiagin, trumpet/flugelhorn; Daniel Dickinson, bass clarinet/flute/tenor sax/alto sax; Joseph Doubleday, vibraphone; Yotam Silberstein, guitar; and Marco Panascia, bass. Fleeting Windows was driven by the birth of Foschi's twin boys in 2015. The album was shaped by the many emotions she experienced over the past several years and all of the songs were written for or inspired by her sons. Foschi feels the record is essentially a collection of little windows that provide a glimpse into her incredible journey of rediscovery and states "I wanted to make a record dedicated to my sons that would somehow capture the myriad of emotions we went through in these past few years. Each song represents a different aspect of this phase in my life as a woman and mother; the good and the bad, the sleepless nights and the banter, the giggles and the fights, the power and strength we need to have as parents juxtaposed to the feeling of utter exhaustion and debilitation." A close friend and mentor of Foschi's, acclaimed arranger and musician Gil Goldstein, is a special guest on the album and adds unmeasurable texture and richness throughout. Their history together is reflected in the choice repertoire and further adds to the intimacy of the recording. Goldstein arranged two of Foschi's originals as well as "Quiet Now" (D. Zeitlin) and "Stay as Sweet as You Are" (Ravel/Gordon), which becomes one of her most poignant messages to her sons. "The music magically came to life with Gil's arrangements" she reflects. "My originals describe moments that he and his wife Ellen very much lived first hand with us, and when he agreed to participate in the making of this record, I knew he would inevitably capture the true essence underlying this project. Not just because of his level of expertise, but because he is such an ever-present figure in my family's everyday life." Among the non-original selections, "Firefly" (K. Barron/C. White) and "My Life" (C. White) were selected as a tribute to bassist Chris White Jr., whom Foschi had the great pleasure of working with before his passing. She adds "We were rehearsing for a show once and I found myself really struggling with "My Life." I was having a hard time relating to the song, so Chris invited me into his studio and shared his cassettes of the original recordings. As we played through it, he walked me through the song's underlying intention and intended phrasing. Although I was able to perform the song at the time, I now finally understand its true meaning and feel that it captures much of the essence of this record."